Well, the college football season is over. It has taken over a week to allow this to set-in. As I mourn the end of the season I am sure my wife is happy to have not as much of the TV taken up by games. However, I want to look back on this past season and to go over a few of my takeaways. Normally, I am a self-proclaimed Alabama hater. Yes, I am a bit jealous that they are always in the big games and get all the big recruits. That being said I have nothing but respect for the team. What Nick Saban did; benching his starting quarterback at half time in the National Championship Game, who had a record of 25-2 coming into the game, took a ton of guts. They earned their title. 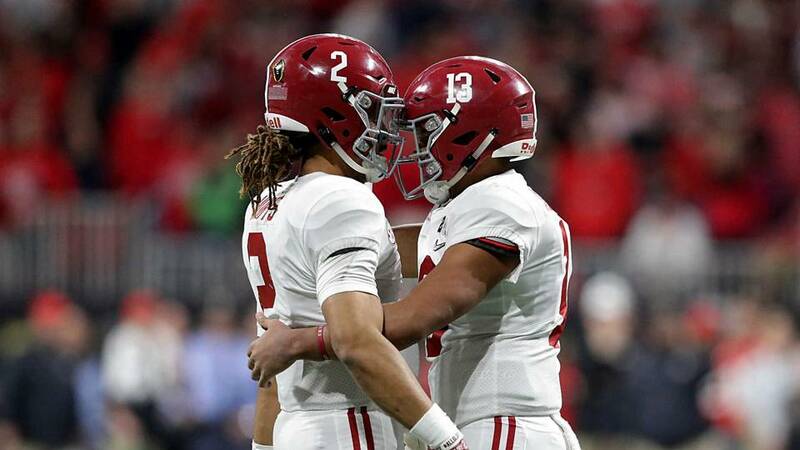 Even more impressive was how supportive Jalen Hurts was towards Tua Tagovailoa, his back-up for 90% of the season, as he played in his game. It shows how Alabama has taught it’s players that it is about the team not the individual. "Why Didn’t We Make it in?" I have a feeling it will be a similar story line every year in college football, this year it was UCF. One team, and it most likely will be a conference champion, will be complaining why they didn’t get selected. I know it’s a tough pill to swallow, but it’s the committee's job to put the best four football teams in the nation into the playoff, not the four best conference champions. This year was a perfect example of that. The national champion was not a conference champion and they ended up beating two conference champions to get there, so that does say something. "Playoffs? You kidding me? Playoffs? What about the Stayfree Maxi Bowl?" So this brings up the next question: Should we increase the college playoff structure to a larger field? Maybe a 6-8 team bracket with the Power 5 champions getting an automatic bid and then allow for At-Large bids. At first I want to say absolutely! Please give me more games! However, when I think about it more, I don’t feel it would be such a great idea. One reason being: It extends the amount of games these kids are playing. We now know are much more aware of the risks involved when playing football. The season is long enough and we don’t want to extend it just for our own entertainment. A professional is at least getting paid to play and until the NCAA addresses this gap, it would be unfair to the players to put their potential earning capability in jeopardy. The other concern: What other bowls would be absorbed by the adding the bracket? I know we all joke about the large number of bowl games and their ridiculous names. If we have to drop some bowls to extend the college playoff it will hurt a lot of small and mid-major programs. These games mean so much to these schools. Look at UAB, just last year they had no football program because it was taken away for financial reasons and now in their first season back they are in a bowl game. Even though they lost the game this was a huge accomplishment. That being said I would like to maybe see bowl eligibility be 7-5 instead of 6-6. We should award winning seasons. Not average. I am talking of course about the Big Ten East. They really need to look at maybe realigning the divisions. Ohio State, Penn State, Michigan, and Michigan State are all probably top 5 of the conference overall and they are all on the same division of the Big Ten. Why is this a problem? Well, it hurts the Big Ten chances of getting a representative into the college playoffs. These four teams will play each other and rarely will a team get out alive with 1 or less losses. Even, with a conference championship a 2 loss team does not get selected to the playoff. The Hokies are on the way. Yes, the bowl game was a disappointment but they did play a very good team. They stayed in the running for most of the game. Oklahoma State just had too many weapons. Now, the silver lining in all of this is the fact that Virginia Tech is still a very young team. Give them a few more years and few more recruits and we will start to be back on the national stage again. It goes without saying I cannot wait for college football to return! I mean college basketball will do a pretty good job of holding me over for awhile. That being said, I can’t wait to share the next football season with my son whose due date coming up in the next few weeks. I need to start him early being football junkie. Thank you all for reading my articles and I can’t wait to write you all more. Check out some of our other sports articles!